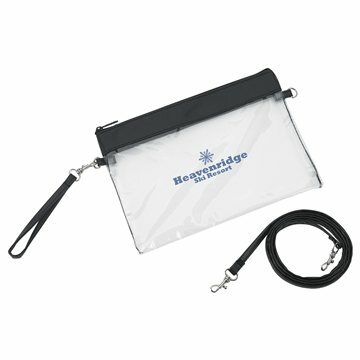 Includes removable wristlet and shoulder strap. The wristlet was shipped separately from the strap. The straps all had to be attached. In addition, the zippers were VERY difficult to close. Once they were closed the first time, they did work ok.
We just put our info on it and left it on seats around campus, lots of fun! No complaints. Item was printed well. Liked least - the scent. It smells like margarhitas. Great! I am very impressed with the wristlets. Production and shipping was fast. Customer service was outstanding!